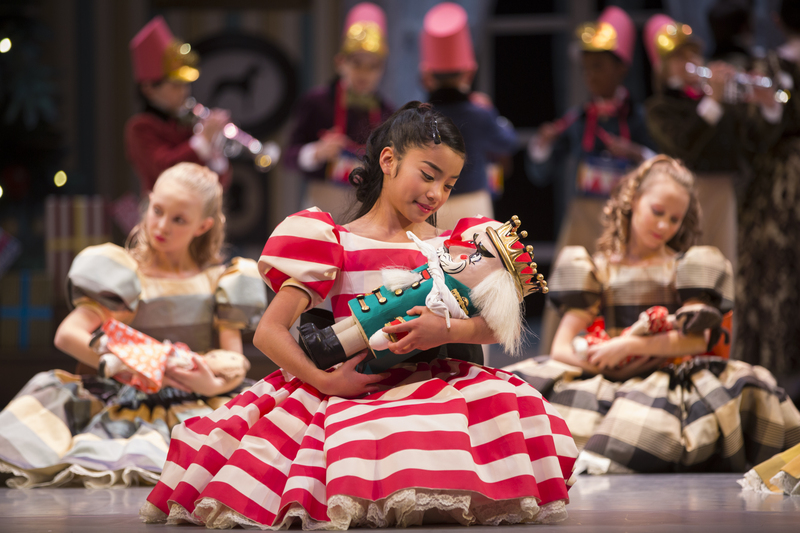 Pacific Northwest Ballet PNB School student Eden Anan as Clara in George Balanchine’s The Nutcracker®, choreographed by George Balanchine © The George Balanchine Trust. PNB’s production features sets and costumes designed by children’s author and illustrator Ian Falconer (Olivia the Pig). Photo © Angela Sterling. 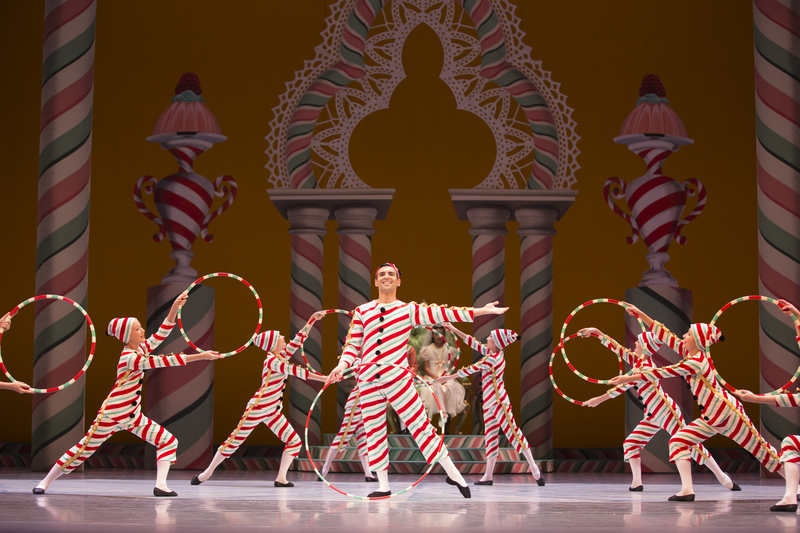 If you are debating whether to take your family to see George Balanchine's The Nutcracker at Pacific Northwest Ballet, and you didn’t go to the iconic show last year, consider this: The reimagined ballet takes a decades-old tradition and turns it on its candy-striped head. Be prepared for captivating, digitally enhanced sets that bring a new polish to familiar settings, costumes so whimsical and vibrant that they make the old ones feel like black and white before Technicolor, and choreography that holds the surprise and suspense of a well-wrapped gift. The new adaptation, which debuted in 2015, is so different from PNB's earlier Sendak-Stowell Nutcracker (which had a 30-plus-year run at PNB before closing in 2014), that only the characters and Tchaikovsky’s magical score might be recognizable to you. The enchanted experience is well worth it, but if you knew the old PNB Nutcracker, or are a fan of the particular story line that often focuses on a young girl’s conflicting desire to both grow up and stay a child, prepare yourself for a bit of a winter chill. Last year, after 32 years of the production, PNB artistic director Peter Boal rebuilt the company's Nutcracker, replacing PNB founding artistic director Kent Stowell’s choreography with George Balanchine’s 1954 version. The slightly creepy, fun-house feel of the sets concocted by Maurice Sendak (Where The Wild Things Are) were exchanged for syrupier surrounds imagined by Ian Falconer, creator of the children’s book series Olivia the Pig. Pacific Northwest Ballet company dancers and PNB School students in George Balanchine’s The Nutcracker, choreographed by George Balanchine © The George Balanchine Trust. PNB’s production features sets and costumes designed by children’s author and illustrator Ian Falconer (Olivia the Pig) and runs Nov. 25–Dec. 28, 2016. Photo © Angela Sterling. With this reboot, much changed. Child dancers are featured more prominently, which is inspiring for the show’s youngest viewers but also left this mom and Nutcracker nut yearning for a bit more adult time on stage. And the plot caters more firmly to younger viewers now, or, to employ an apropos analogy, to those who prefer their sweets more straightforward than complex (think candy canes and gingerbread as opposed to Turkish delight and plum pudding). In the Senkak-Stowell version of the show, Clara, the tween who is both intrigued and repelled when her eccentric godfather Herr Drosselmeier shows up to the family’s holiday party, embarks on a dreamscape of adventure that invokes a fantasy, more grown-up vision of herself (danced by an adult dancer) and her Prince during the romantic second half. That pas de deux will forever be on replay in this eternal romantic’s memory. To me, it was special because it captured the ineffable essence of a girl’s reverie of who she might become. The soul of Stowell’s story was the precious, liminal space of girlhood slowly falling away like gentle snowflakes. 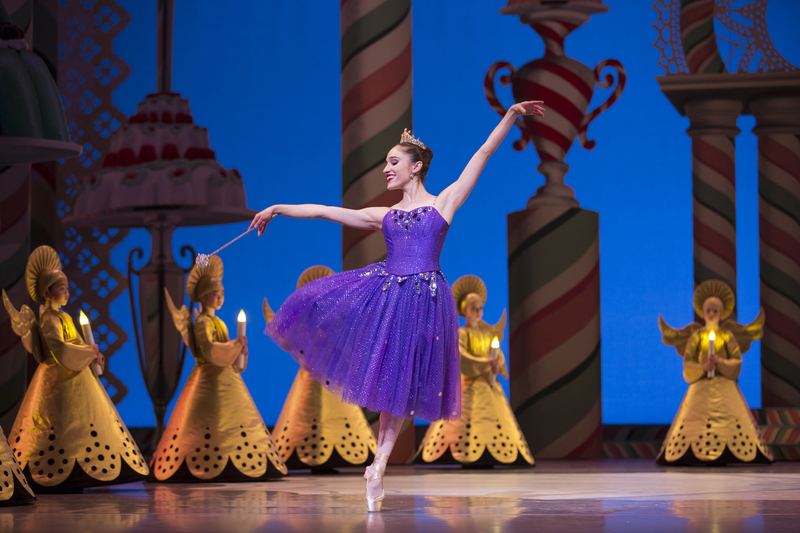 Pacific Northwest Ballet soloist Leta Biasucci as the Sugar Plum Fairy, with PNB School students in George Balanchine’s The Nutcracker®, choreographed by George Balanchine © The George Balanchine Trust. PNB’s production features sets and costumes designed by children’s author and illustrator Ian Falconer (Olivia the Pig) and runs through Dec. 28, 2016. Photo © Angela Sterling. The new choreography, Balanchine’s, casts Clara and the Prince as children for the entire production, leaving the heroine sitting out the second act as the pair watches the performances put on for them in the Land of Sweets. The romance, as it were, all happens between the Sugar Plum Fairy (a character not part of the Sendak-Stowell version) and her cavalier. Because we don’t see the evolution of their relationship, the way we do with Clara and the toy Nutcracker she's given (later to become the prince), it’s hard to fall in love with this part of the story. In exchange, however, we are dazzled by details that wink at the cleverness of their makers and really embody the joyful spirit of the holidays. That spirit might be on the chaste side, but it delights in its own jingly, memory-making way. 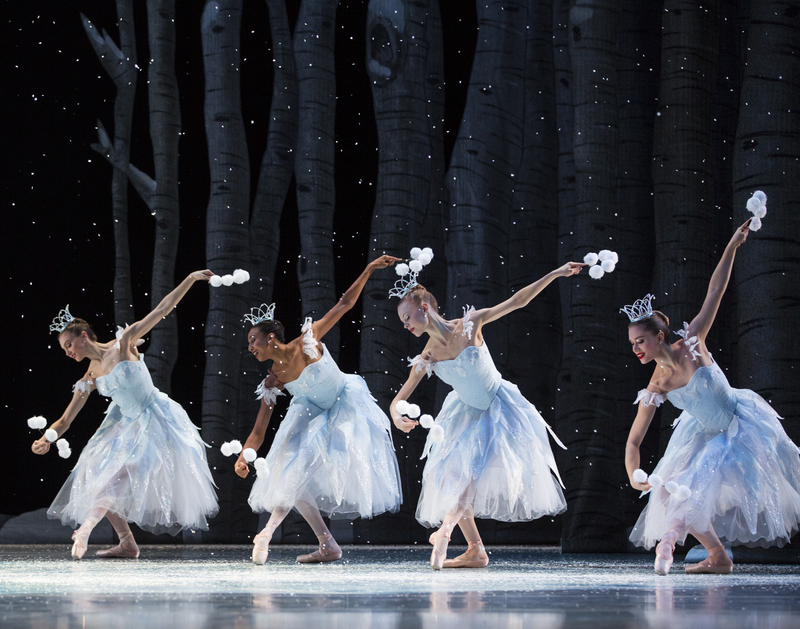 When: George Balanchine's The Nutcracker runs through Dec. 28. Show times are listed online. Arrive early to allow time for parking, pre-ordering intermission snacks, participating in pre-show activities, and collecting booster seats. Where: Marion Oliver McCaw Hall, 321 Mercer Street, on the north edge of Seattle Center. Tickets: Tickets range from $25–$190. Buy online. Every family member must have a ticket, even infants. There are no bad seats at McCaw Hall so buy the seats that suit your budget. Tickets can be purchased online. Activities and Events: All special events can be found on the PNB web page. Parking: The Mercer Garage is connected to McCaw Hall by a sky bridge. Rates vary. Surface lots in the neighborhood may be slightly cheaper. Street parking is limited to 4 hours during the day, and hard to come by. Consider taking the bus – plan your route online. If you haven’t been to Seattle Center recently, be aware that Mercer and Roy streets have both been opened to two-way traffic.